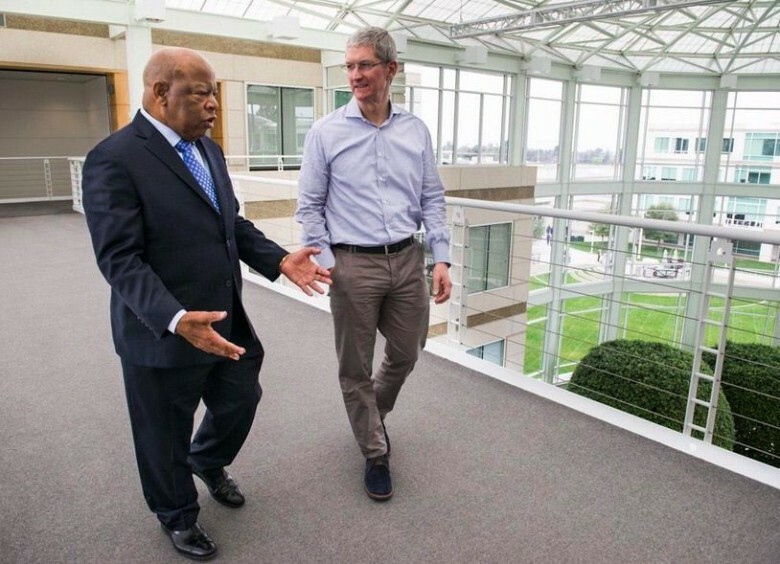 Congressman John Lewis paid a visit to Tim Cook at Apple’s Cupertino campus today as part of the civil rights icon’s Northern California tour for his new book. The Georgia lawmaker played a pivotal role in the bloody Selma march that’s back in the spotlight thanks to the its 50th anniversary and the Oscar-nominated film by the same name. Lewis was a guest speaker at Apple HQ today as part of the company’s celebration for Black History Month, and he met privately with Cook. Lewis is meeting with Google executives tonight and is hosting book signings Wednesday at the San Francisco Public Library and San Francisco State University for his new graphic novel, March: Book Two. The book is aimed at giving a new generation of Americans a behind-the-scenes look at some of the most pivotal events in the the civil rights movement. Cook, who recently came out as gay, has been a huge proponent of civil rights and equality as Apple’s CEO. He has posters of Martin Luther King Jr. and John F. Kennedy hanging in his office.